Accessible from the Klipboard web admin dashboard, the intuitive drag and drop scheduler with dispatch enables you to allocate and schedule tasks to your field workers mobile or tablet app easily and efficiently. The calendar also gives you full visibility of your business so you can view the workload for your entire workforce at one quick glance. An easy to use drag and drop system means that each task can be scheduled to the appropriate field worker at the required date and time. A task can also be re-allocated to a different date or time, or to a different user if necessary. 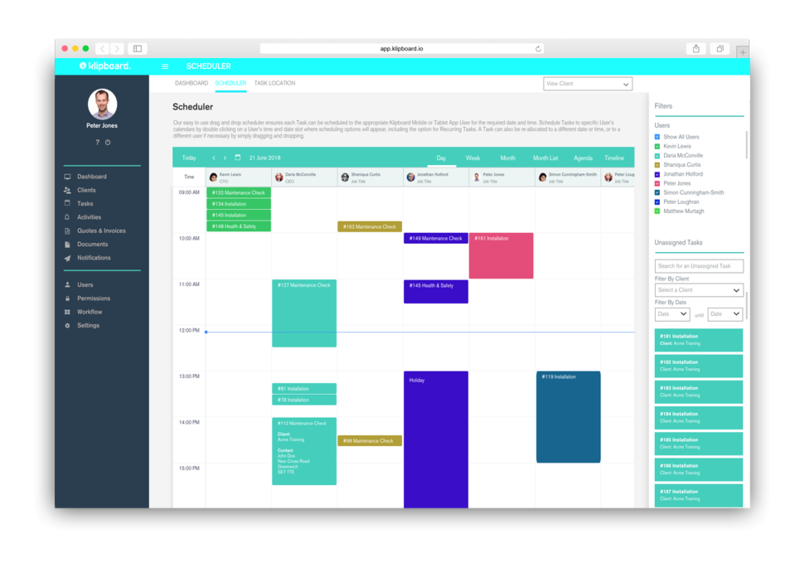 View the timeline of scheduled tasks, this is shown as default in daily view, however this can be changed to view the week, month, month list, agenda or timeline view. You can also search a specific date an overview of all the allocated tasks and field workers’ schedules for this date. The scheduler is shown in business hours by default, however, you can also view the full day if required. 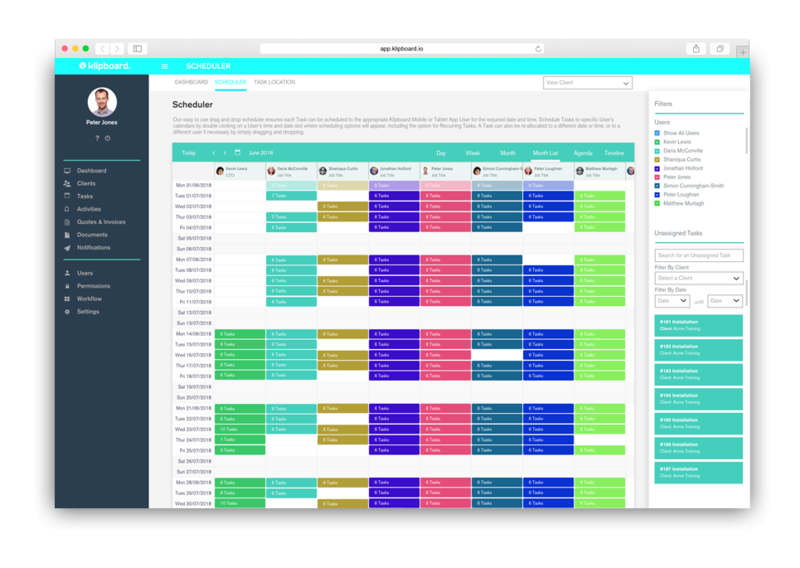 You have the option to filter the user view at any point in the scheduler by selecting the users on the right that you would like to see the selected tasks for. This allows you to have a focused view across specific users allowing you to make quick comparisons between different engineers. This can be useful to see if a user is available to cover work for another user. You can schedule tasks to specific users calendars by double clicking on a user’s time and date slot where scheduling options will appear, including the option for recurring tasks. If you want to view the full details of a task, you click the scheduled task and have the ability to view or amend the task there and then. 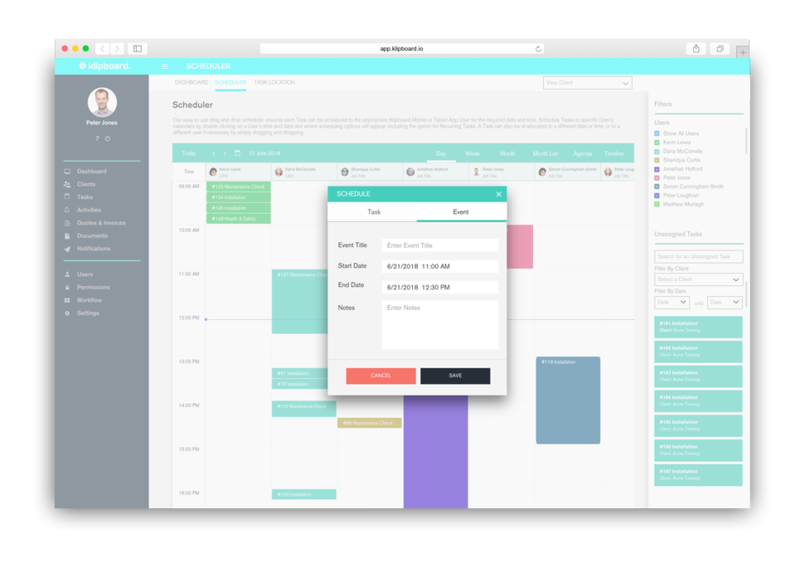 You can create specific events for a user over a period of time – this could be used to identify if a user is out of the office on a particular day. Fill out an event and this will be indicated on the users schedule across the day or period of days. 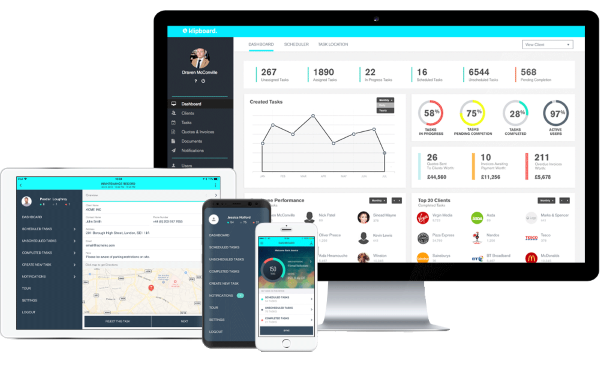 These features give you complete oversight of your field workers schedules, the tasks that have been allocated and gives you complete control in just a few simple clicks.